on the heels of audi's debut of the r8 lms gt3 at the 2018 paris motor show, the automaker announced the arrival of the volume version of the automaker's halo car. the revised 2019 audi r8 coupe and convertible will go on sale in europe in early 2019 with sharper styling, an updated used engine and a modified suspension. for 2019, the r8's v-10 returns and is again available with two outputs. audi says the new model's 10-cylinder is amped up and will deliver "almost identical drive technology" to the r8 lms gt3; that model is good for 585 horsepower. the current 2018 r8 makes 532, 602 or 610 hp depending on the model. 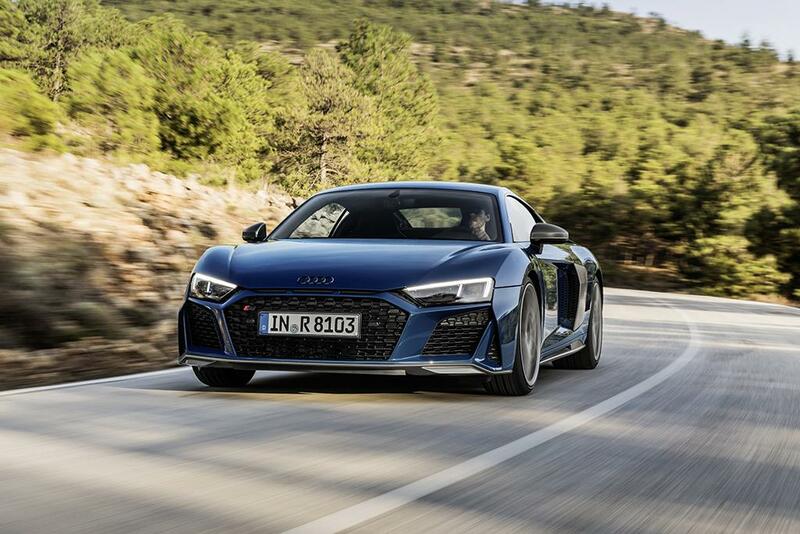 outside, the new r8's sharp angles become even more honed with a wider, flatter grille and flat slits in the hood. in back, a wider diffuser sits between more sculpted, round exhaust ports, replacing the previous r8's trapezoid-shaped exhaust tips. two new metallic colors also join the lineup: kemora gray and ascari blue. we're hoping to catch a glimpse of it at the upcoming 2018 los angeles auto show. press days for the l.a. auto show start on nov. 26. check back here to see if the new r8 makes its stateside debut.